About four years ago I climbed a rock face, a 3,300-foot rockface called El Capitan, in Yosemite Valley in California. It was exciting. If we really compared our climbing ability, my friend Jeff, with whom I climbed, is probably a bit better climber than I am. But we topped out on this rock face, and Jeff's head lamp was broken. Even though Jeff is a better climber than me by day, guess who was a better climber at night? We had to get down from this rock face. Just as the last bit of sun was setting on the mountain, Jeff looked at this book, and it said, "Do not try this descent in the dark; eight people died last year." We were in trouble. I had to lead Jeff out of the mountains. I climbed below him, and I put his feet in these little holes on the rock face. He made little noises like "AAAH, AAAH, AAAH!" which I found quite amusing. Then when we got off the rocks, I kept us on the trail by feeling the packed dirt under my feet, just as I do during the day. I was a little nervous to be guiding Jeff, but I knew that in that situation I was the person for the job. I think the powers-that-be, those great forces in the world, convince us as blind people that certain people are born to lead, that people who are the strongest and fastest and see the best are the leaders in the world. That is just not true. We know that as blind people we can be leaders just like anyone else. We know that the only qualities we really need to be leaders are a little bit of skill and a lot of courage. We know that the best way to lead is to get out there and, as climbers say, "Take the sharp end of the rope and lead by our example." The National Federation of the Blind is sponsoring a couple of climbs: a climb to Ama Dablam in the Himalayas and a climb of Mt. Everest. We just got back from Ama Dablam, which was a practice climb. We chose the spots for these climbs for a couple of reasons. One, because for some reason when a blind person hangs by his finger tips off an ice face or a thousand feet off the ground, it gets a lot of attention. Because of that, climbing is a wonderful platform for talking about blindness, talking about the issues of blindness--the story of blindness, the wonderful work that the National Federation of the Blind does--and a platform to make the NFB sort of a household word among the population at large. As Dr. Maurer put it so well, "To attach blindness to a sense of adventure"; I like that one the best. We can also begin to pass on leadership, and I think that for me is an incredible legacy. As I say, Mt. Everest is the highest peak in the world, 29,035 feet, but it will take us conservatively about nine days to get to base camp. It's a long, rocky trail up to base camp at 17,800 feet. We'll take yaks for our gear. You can't climb mountains like Everest outright; you can't just go straight up it. From base camp it'll take us between a month and two months to get to the top, weather and health permitting. If you just drop a person off at the summit of Mt. Everest via helicopter, within thirty seconds you pass out, and within another thirty seconds you'd be dead. That's because at the top of Mt. Everest there is only about a third of the oxygen that we have at sea level. So you have to acclimatize; you have to climb the mountain slowly; you're shuttling up the mountain through the succession of camps, getting a little bit higher and a little bit higher, convincing your body that it can breathe less and less oxygen, that it can survive up there in what they call the death zone. I believe that as a climber and in life that your contributions to a team need to outweigh the accommodations that are being made for you. That's why, when I'm climbing and I go to sleep each night in my tent, I want to be able to point to a few things that I've done that day that have contributed to the team's success, like building snow walls or setting up tents or carrying just as much weight as everyone else. I never wanted to be just a token; I wanted really to contribute to the team. One of the accommodations made to me as a climber in climbing Mt. Everest will be communication. 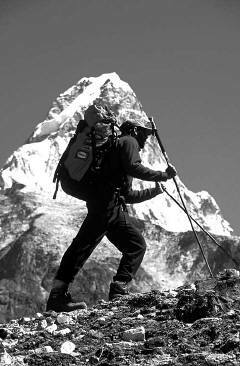 My sighted teammates--I will have nine strong Himalayan climbers with me, none of whom is a paid guide; we're all just friends--but they will communicate with me, tell me terrain changes, tell me whether we're on a steep ridge, whether we're climbing up over a big rock and down the other side. I'll need to know those kinds of things. Because at 25,000 feet you start going on bottled oxygen, you cannot communicate in the oxygen mask. It restricts you from talking, so we'll have to create some microphones inside our oxygen masks that will enable my team to communicate back and forth. We'll wake up on summit day about 11:00 at night, and we could summit anywhere from 10:00 in the morning until 1:00 in the afternoon. Mt. Everest has pretty bad storms usually most afternoons, so you want to be down off the mountain as soon as possible and back safely in your tent. Some of you know the story, Into Thin Air, in which some people got stuck out in those afternoon storms and got into some trouble. We just got back from Ama Dablam. Ama Dablam is right next to Mt. Everest. It's almost 23,000 feet. It's much more steep and technical than Mt. Everest. Mt. Everest is basically a snow slope, which takes you to the top with some periodic rock. Ama Dablam is a very steep rock face. The Sherpa people, who are the local people, call Ama Dablam the mother's jewel box, because of the mother, the goddess of the Himalayas, and the jewel box, a giant hanging glacier that you have to climb up and over to summit the peak. We started out on this trail; it took us about six days to get to base camp. Some interesting things happened along the way. Number one, my friend Chris and my other teammates, they hike in front of me wearing a bell--I stick a bear bell to their pack and one to their ice ax so I can hear them jingling in front of me. 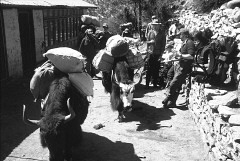 But the yaks going up Ama Dablam and Mt. Everest also have these same kind of bells jingling from their necks, so the Sherpa people thought we were these strange yak people from the west because we were jingling along the trail. They thought it was really strange. They would point and say, "Yak man, yak man." Second, because I have a reasonable amount of skill using my long trekking poles and hiking and I'm not tripping and stumbling, a lot of the Sherpa people, the local people of the region, started feeling like I was cheating, like I wasn't really blind--maybe I could see a little bit, and I was there trying to get attention or something like that. This rumor got around among the women in the market place that I could really see, so they waved their hands in front of my face to test me. I would feel the wind from their hands, so I would flinch, and they would say, "See that proves it, he can see." I didn't know what to do. This was becoming a real problem because everyone was telling me, "We think you can see." Part of the point was that I was blind, and I wanted them to know that. So I thought, okay I am reduced to drastic measures. I didn't know what else to do. I don't want to gross anyone out, but I lost my eyes a few years back to glaucoma, so guess what I had to do to prove to the Sherpas that I was actually blind? Well I proved it to him. He was a little grossed out, but when he left the room, he was thoroughly convinced. The head Sherpa passed it on to the rest of the Sherpas. He said, "He is blind; there is no doubt about it." I think sometimes as blind people we are reduced to drastic measures to prove to the sighted world, whether it's in this culture or the Sherpa culture, that, even though we are blind, we can do the job. We can do it successfully. When we got to our base camp at 16,000 feet on Ama Dablam, we started working our way up the mountain. We had to cross a giant boulder field. The upper mountain is so steep that rock pours off it, and it creates this giant hodgepodge of boulders that you have to leap across. There can be big gaps between them. Sometimes there are boulders up on a ridge where you don't want to fall off the sides. They are very uneven; there is no rhyme or reason to them. Boulder fields do not meet Americans-with-Disabilities- Act requirements. It's a blind person's nightmare for sure. Actually, if I was really mean and I really hated a blind person, I would stick him in the middle of a boulder field. We had to get across this boulder field. There wasn't any easy way, but we kind of trudged across it, and we got over it. At 19,000 feet we met the steepest part of the climb, a vertical thousand-foot rock base, climbing it to almost 21,000 feet with heavy gloves and plastic boots. It was really beautiful climbing. We got to over 21,000 feet, and at that point we were stopped by weather. The monsoons were coming in from the south earlier and earlier every day, blasting us with horizontal snow and huge wind and freezing weather. All the rocks were piled up with snow, and ice covered over our ropes so it was difficult to rappel off them. We tried to get a little bit higher. Rocks and ice were pelting our helmets. It was very dangerous, and we decided this is really a practice climb. The point isn't to summit this peak--it's to get prepared for Mt. Everest, so we decided to turn back. We came down the mountain. We had to cross down over those vertical sections and across about a thirty-foot traverse with no footholds that we nicknamed abject terror, because there's about 5,000 feet of air under your feet, and you are hanging off these old ropes, and your feet are just slipping on the rocks. It's really terrifying. I had spent eight days at 21,000 feet with my friend Eric Alexander. This climb was being covered by Quokka.com, giving the NFB lots of publicity. When we were at 19,000 feet, they reported that Eric--and this was true--that one of our climbers had slipped and fallen 150 feet. That was not me; it was my friend Eric. Luckily he landed on a tiny ledge. He had on a pack that saved his spine. He had a helmet that saved his head. It was a real miracle. He climbed his way back up through slab rocks, and soon after that he went into shock. He got pulmonary edema, where his lungs filled up with fluid and the oxygen in his blood went down to forty percent, which is really bad, near death. So Steve Gipe, our doctor, brought him all the way down through the boulder fields to base camp. At the same time, our teammates who were down at camp one climbed all the way back up the mountain, crossed Abject Terror, and helped us carry loads down the mountain. About 10:00 o'clock at night, after coming down in this twelve-hour storm, we all came into base camp together. We met Eric and the doctor down there. It occurred to me that, if we had summited Ama Dablam in perfect, beautiful weather, we wouldn't necessarily have proven what we went there to do, which was to find and prove our strength as a team. But we did, and I think that meeting such adversity and bad weather on this climb enabled us to find our strength as a team, to find the very best qualities within us. I saw it as a very positive training and preparation experience. Eric, by the way, got helicoptered off the mountain, out of base camp that next day, and he is recovering safely in Colorado now. We are excited to go up Mt. Everest next year. We're ready, we'll be honed physically and mentally, and we are accustomed to the region now and the people. We'll make a really good team as we climb Everest. I think the most beautiful legacy of this climb will be in the way that we pass leadership down to other people, especially young people. I have a friend named Steve Akerman. He's a partial quadriplegic; he pedals his hand cycle, using just the power of his arms. He pedaled his bike around the world. It took him almost ten months. He went through eighteen countries. At the end of his ride he said to a group of people who had gathered to watch him come into Washington, D.C., "The word encourage is the most powerful word in the English language--to give people the courage to do great things by our own example of doing great things." I think that is so powerful because this climb can go a little way in helping blind people in particular to live their lives as they see fit, to make their own rules, to build their own parameters, to shatter perceptions, to blow through stereotypes, and to throw out the sighted world's expectations and rise to the level of our own internal potential. If I can be a part of that through this climb, then I'm very proud. I'm also proud to be part of the National Federation of the Blind. I think it is appropriate that the NFB, the most powerful blindness organization in the world, is climbing the highest mountain in the world--a perfect match.